Get in the game and show San Diego Chargers team pride with our collection of mascots and insignias. National Football League TeamRugs™ for cars are made of 100% nylon pile. 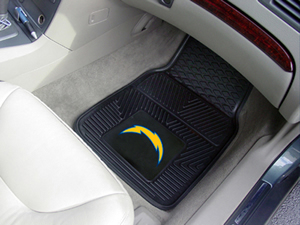 San Diego Chargers NFL team logo floormats are injected with colorfast dyes throughout to make them both durable and beautiful season after season. San Diego Chargers NFL TeamRugs™ are perfect for use as an interior floor accent rug. A must have rug for every game room.